ANSON, George. Voyage Round the World. in the Years MDCCXL, I, II, III, IV. By George Anson Esq; Commander in Chief of a squadron of His Majesty's Ships, sent upon an expedition to the South-Seas. Compiled from papers and other materials of the Right Honourable George Lord Anson, and published under his direction, by Richard Walter, M.A. Chaplain of His Majesty’s Ship the Centurion, in that expedition. Illustrated with forty-two copper-plates. London: Printed for the Author; by John and Paul Knapton , 1748. First edition. Quarto (9 7/8 x 7 3/4 inches; 252 x 196 mm). [2, blank], , [1, blank], 417, [3, blank] pp. With the list of subscribers and forty-two numbered engraved double-page or folding plates and maps. Bound without the directions to the binder leaf. Full contemporary brown calf, rebacked to style. Boards ruled in gilt. With red morocco spine label, lettered in gilt. Top edge brown, others speckled red. Light wear to corners and some rubbing to boards. A bit of light scattered foxing. Previous owner's bookplate on recto of front free endpaper. Previous owner's ink notes on verso of front free endpaper. A very good copy. “This is the official account of Anson’s voyage. England, at war with Spain in 1739, equipped eight ships under the command of George Anson to harass the Spaniards on the western coast of South America, for the purpose of cutting off Spanish supplies of wealth from the Pacific area....Lord Anson, who was a friend and patron of Benjamin Robins, after returning from the voyage around the world in the Centurion, appears to have entrusted to Robins, for revision, the account of the voyage which had been compiled from the journals by his chaplain, Richard Walter. It is probable that Robins revised and edited the work, wrote an introduction, and added dissertations....This compilation has long occupied a distinguished position as a masterpiece of descriptive travel. 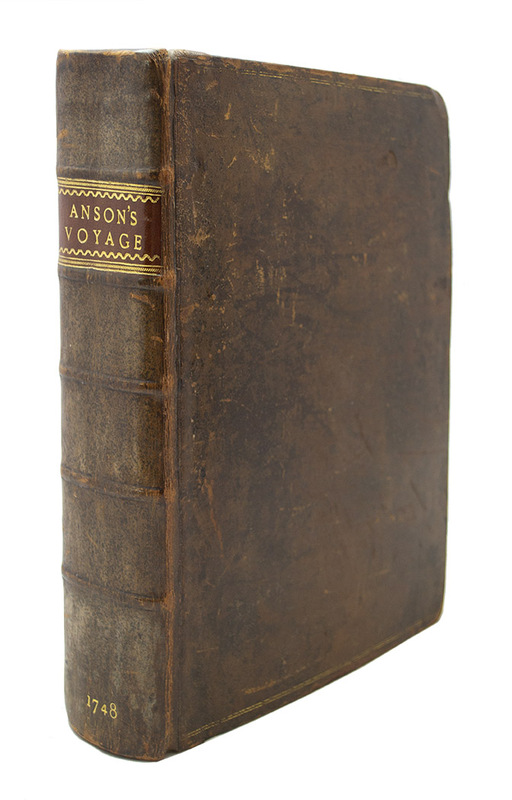 Anson’s voyage appears to have been the most popular book of maritime adventure of the eighteenth century” (Hill). Cox I, p. 49. Hill I, pp. 317-318. National Maritime Museum I, 109. Sabin 1625.